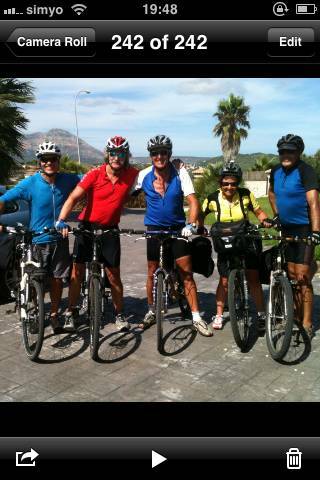 Easily found the cycle way out of Gandia and made our way to Oliva and had a brief breakfast stop before heading to Pego . Met Simon and Stella's friends Jane and Fred for coffee. They had seen us off from Walton Bridge at the start and were starting on their trip back to the UK after some time touring ( by car ) in France and Spain. Some hills to Alcalali for our last meal on the road....sangria, calamari, sepia and "little fish" . So much for Simon's downhill after lunch, little inclines in a car translated to 240 metres vertically to his house . Every pedal was worth it though...Benitachell is a pretty town and SImon and Stella's place is a real oasis, beautiful pool, garden, views and a Spanish house that embraces the climate and lifestyle. Met by Stella and the local press complete with Photo session and interviews then it was cold drinks and into the pool. Stella had done us proud with a delicious cake . It is too soon to rush into print with our reflections on the trip....it has been a great adventure and challenge , all the better for having been shared with old and new friends. Thanks to all of you who have followed and supported us ...and a special thank you to Amy Fox ( Happy Birthday Amy),who from London has loaded our photos and words onto the blog for us .